Ansonia Clock Co. crystal regulator, "Crown", C. 1914. 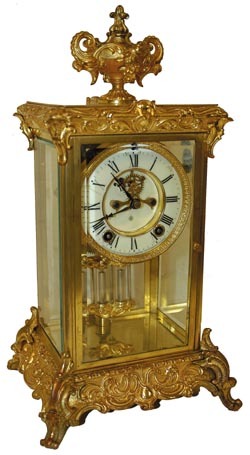 Case body is polished brass, top, base, pendulum, and ornaments are rich gold plated. The original gold remains on 90 percent or more of the ornaments. Some slight wear in places where handled by human hands. Bruce Baziluk, the perfectionist, restored this clock, taking great care as he always does to keep the clock as original as possible and still retain the beauty that Ansonia collector\'s desire. Two piece porcelain dial, open escapement, hands, all clean. 8 day movement, striking hours and half hours on a standing gong, rack and snail count, movement is signed. Case is 15.5" high, has 4 perfect beveled glasses. Ly-Ansonia #357 .